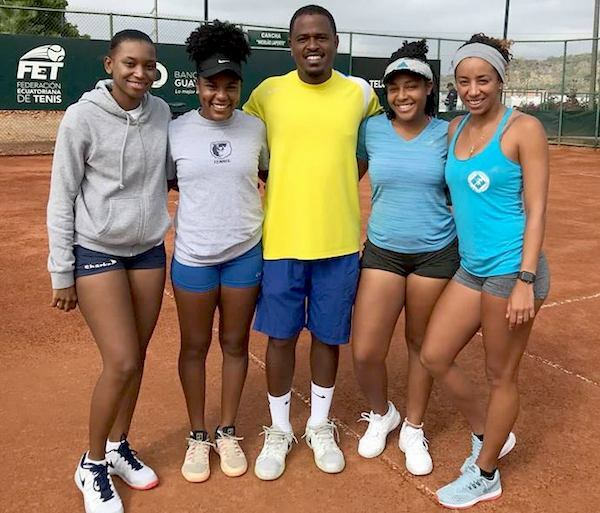 The Bahamas Fed Cup Team has gotten off to a blazing start! The Bahamas faced the number one seeded country in the tournament, Bolivia. In the first match of the day, Danielle Thompson opened up competiion with a strong performance against Daniela La Fuente Strassburger of Bolivia. Bahamain Danielle won in straight sets 6,3 6,2. Danielle expressed that there were some nerves at the beginning but she wanted to come out strong. "Representing my country with the letters on my back and my teammates cheering me on was really good" said Danielle. She said she played to the best of her ability and left it all on the court. She wanted to set the tone for the day. And the tone was set from her fine performance hot out of the gates. Teammate Kerrie Cartwright said that "Danielle came out aggressive and eager and I loved her energy and also loved watching her play." With the first win secured and in the record books, Kerrie Cartwright showed calm precision allowing no points from Noelia Zeballos in the first set. Despite this smooth start Kerrie expressed that there were some nerves on her side at the onset that she played through it. Kerrie said the match was tough and her opponent was a good player, "I am glad for the win, I knew my opponent was a tough player as I travelled to many tournaments with her and watched her play many times." In the second set Kerrie dispensed of Zeballos 6-3. Kerrie said "We went out there to destroy and we are happy to get the win." With Rubbers 1 and 2 secured Team Bahamas already recorded a win over Bolivia. Up next was doubles, playing for the Bahamas were Simone Pratt and Sierra Donaldson. This would be the first time the duo has paired up and the chemistry was good. Pratt and Donaldson played well and lost in the closely contested first set 5-7 to La Fuente and Zeballos of Bolivia, (who both played previously in singles competition). In the second set the Bolivians won 6-2 despitie the effort from Pratt and Donaldson. Danielle applauded the duo saying"their energy was good and they fed off each other and played well together"
Overall, The Bahamas won over the Bolivians 2-1. Sierra Donaldson and Simone Pratt both expressed excitement about the tournament and the wins The Bahamas has experienced so far. They believe that The Bahamas will continue to do well as the tournament progresses. The Team is Captained by Veteran Coach Marvin Rolle. Marvin expressed that it was a good performance by Team Bahamas today. He stated "Danielle was strong and it was good showing for her first singles Fed Cup match. Kerrie came out very strong and played great, the first set was a clean sweep. Also, Sierra and Simone played well in doubles with a set point in the first set but were not able to convert." Marvin is positive about the prospects of The Bahamas in this tournament. 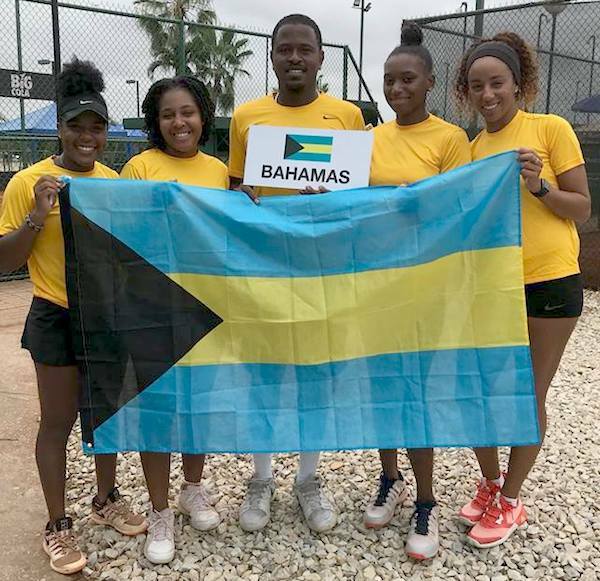 Despite being viewed as the underdogs in this matchup against the #1 ranked Bolivian team, The Bahamas was able to exhibit a sense of calm under pressure and played great tennis and secured the win. The Bahamas Lawn Tennis Association is proud of the ladies of this dynamic Fed Cup Team. The opening win is a great start and the win against the team ranked number one is a great feat. The Bahamas is expected to play Trinidad and Tobago tomorrow who also won 2-1 in tournament play today. The event is being held in Guayaquil, Ecuador. Participating nations are Bermuda, Bolivia, Costa Rica, Ecuador, Honduras and Trinidad.